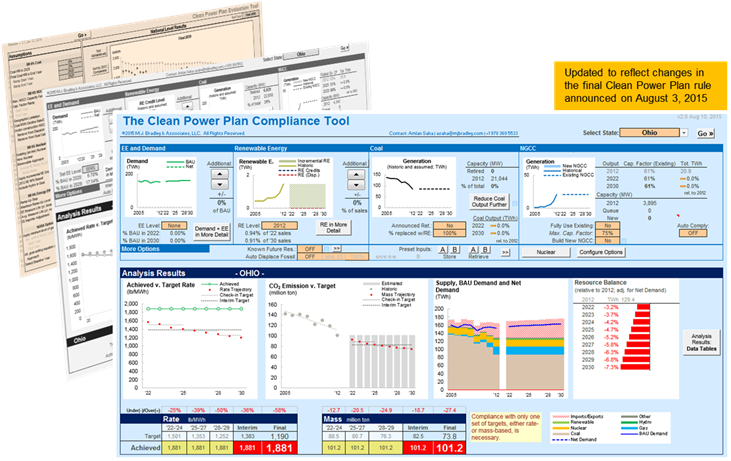 MJB&A has developed a tool to allow users to analyze state progress towards compliance with the final Clean Power Plan rule under a range of electricity demand and generation scenarios and a variety of emissions reduction targets. The tool incorporates policy options outlined in the final rule, and provides the ability to alter all major drivers of state electric sector emissions and ascertain their impacts on state’s CPP compliance status. Results are analyzed and displayed based on real-time changes made by the user in a variety of graphs to track how each option influences compliance with interim and final targets.